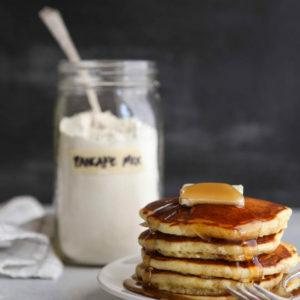 Easily make homemade pancakes whenever the mood strikes! One batch of pancakes make 10 4-inch pancakes. In a large bowl, whisk together all of the pancake mix ingredients. Store in an airtight container for up to several months. Combine 1 1/3 cup of the pancake mix with the water, egg, butter or oil, and vanilla (if using). Drop by 1/4 cup-full into a greased hot skillet set over medium heat. Cook until edges appear dry and bubbles appear on the surface, about 2 minute. Flip and cook another 1-2 minutes on the other side. Serve immediately as desired, or keep warm in a 200 degree oven until ready to serve. Starting with room temperature liquid and eggs will prevent the melted butter from solidifying into tiny droplets when you add it to the wet ingredients, OR you can stir in the melted butter at the very end after you’ve combined the wet and dry ingredients. Whisk the wet and dry ingredients only until just combined, do not over mix the batter. It’s okay if it’s a little lumpy. This will produce a more tender pancake. I prefer to use a cast iron skillet or griddle for pancakes, as it creates a great golden exterior. To keep pancakes warm and crisp until you’re ready to serve, place them in a single layer on a sheet pan in a 200 degree oven. Pancakes freeze really well! Place a sheet of parchment paper or wax paper in between each pancake inside a ziplock bag or plastic container. Store for up to 1 month. Reheat in the toaster. You can save a lot of money on water development by taking cattle to existing water sources with temporary electric fence. A few more thoughts on grass regrowth, animal production and timing. In the first two stories of this series we covered some terms used in managed grazing, provided their definitions, and explained why the terminology and the ideas they represent matter. In this third and final article of our managed grazing primer, we’ll cover some important concepts that aren’t based in terminology. Early in the days of managed grazing there was a huge and largely mistaken emphasis on grazing plants in Phase II, or vegetative state. Young forage is high in nitrogen/protein and low in energy, while older forage is higher in energy and better balanced in a ratio of nitrogen/protein, although it has higher indigestible content. This older attitude foiled the greatest advantages of managed grazing. It never let the plants work with soil life to build soil. It never let the grazier build much forage reserve for winter or for drought. Last but not least, we were told for years the quality of taller, older forages was so poor that cattle could not perform on it. That is not necessarily true of properly managed, multi-species pasture where soil health is on an increasing plane and cattle are harvesting forage for themselves. It’s all in the management. One of the most important concepts to managing livestock well on forage is to recognize livestock production and nutritional needs and graze accordingly. When your animals need quality for growth or lactation, you shouldn’t demand they eat deep into the plant canopy, consuming older leaves and stems. If you have dry cows or are dry wintering cattle, you might ask them to eat more of the plants. Again depending on livestock class and forage conditions, an affordable and well-designed supplement program can let you graze more severely, also. Nature is chaotic and constantly changing, so your grazing management needs to be also. If you graze the same areas the same way and same time each year, you will develop plants you may not want because they will try to fill the voids you are creating and you may hurt plants you desire because they will become grazed down and weakened, perhaps at critical times. If you move those grazing times and even change animal densities and perhaps also add other grazing species, you will create more diverse plant life and soil life. Remember, too, that your livestock don’t need to eat everything in the pasture to do a good job grazing. Water is always a limiting factor for managed graziers, but the low-cost solution in many cases is to make cattle walk back to water. Certainly you can eat up thousands of dollars of profit by installing excessive water systems and numerous permanent water points. This can be overcome to some degree with temporary fencing back to water and using existing water sources. Read Part I or Part II. 3 week old chicks having fun with scooped gourd goo and seeds. still in their ugly stage. Happy chooks. Good grief; I’m growing sprouts for my little flock. This forage mix is the same as the pasture mix drilled on my farm this summer. One month old – tired of these sweeties in the basement – nice weather and i finished up the ‘pullet grower station’ – they are still a bit freaked out by the move, but won’t be long before they’ll be running around like they are free! went from 11 square feet to 39 square feet! This was taken 4 February 2018 – it’s been bitterly cold this winter and although the hens are quite big by now and still in their brooder, they are still immature. I’m probably spoiling them, but they surely do prefer these sprouted grains vs dry grains. I was even warming them a bit in the oven during the most brutal cold. These 23 big girls (plus a couple roosters that will be lunch someday) did well this winter in their brooder. (Here they are at 3 1/2 months old) from Cackle Hatchery. Feed is sunflower seed, millet, oats, peas from Welter Seed & Honey with occasional soaked alfalfa pellets. Minerals provided by Thorvin kelp also available from Welter Seed & Honey. Work on the chicken tractor has been continually hampered by brutally cold temps and wind. Slowly getting it done, but seems like i build a thing twice since i typically have to start by undoing what i did the day before. 😦 But, that is not unusual when flying by the seat of the pants projects: each basically a prototype. I’ve built several different sizes and types of eggmobiles and chicken tractors over the years and each one is a new design and always using as much scrap material as possible to keep down costs. Should be enjoying fresh pullet sized eggs in about 3 months. From delivery of chicks to first pullet eggs is typically about 6 months. So before 25 hens are even laying or producing anything at all, your backyard laying hen project has invested a total of $1486. That’s a lot of eggs you could have bought at $4/dozen. But now that they are laying, there should be about 1 1/2 years of good laying, but of course the feed and labor expenses continue. Labor will slightly increase because I’ll be moving the chicken tractor to fresh grass everyday and collecting, sorting, washing (if needed), and packaging the eggs EVERYDAY. Value of spent hens is negated completely by labor costs associated with butchering. All this assuming that in one night along any part of this route, a fox, raccoon, neighbour’s dog or coyote doesn’t come in an annihilate all your hens. Now winter laying could be increased somewhat by keeping heat and light on the hens. Certainly, i could be the typical farmer and say ‘well….if i don’t count my time….but that would be unfair, right? He’s taken ALL the risk, done all the labor, built all the infrastructure, and cared for them every single day. If i removed all the labor costs from the scenario, cost per dozen is $6.63/dozen. Why am i doing this? good question. it’s ridiculous actually, except i cannot buy eggs from hens on pasture being fed non-gmo and mostly organic grains in our part of the world and they do taste better and have more nutrients (according to various tests). These are real costs to produce eggs from hens on pasture, not inflated or overpriced. Lowering production costs is easy – stacked cages with 67 to 76 square inches of usable space per hen being fed well balanced diet of conventional grains and no chance of being eaten by predators. Automated egg sorting, washing, and packaging. Find employees who will work for minimum wage or less in dusty conditions. Tightly confined conditions allows for fewer employees. Hens will be allowed to lay for less than a year (until first moult) and then replaced to maintain high production year round. This part can also be done on pasture raised as well and would be a good idea. Production drops considerably after that first moult, so replacing them with younger, higher producing hens would reduce costs a little. On Sunday afternoon, i threw a thawed 4 ish lb sirloin roast into a small electric roaster. I must admit, i use this little roast unrelentingly, yet only paid $5 for the thing! It was at a church fundraising bazaar and that is the price marked on it. I did not like the noisy little fan on the air roaster, so it was simply removed and the holecovered with tape. Done and done. Once finished cooking, the result is a lovely tender sirloin roast, a bit over 2 cups of rich beef broth, and a small amount of nutrient rich clean fat – all of which will be used for cooking. Day 1: Sliced roast with smashed sweet potato and fresh salad. Not much more to say, very delicious, simple, and filling. Pictured here is one small smashed sweet potato and about 3.5 ounces of beef roast and a ubiquitous power salad. Day 2 – Beef & Vegetable Soup – was planning something else, but my husband came up croupy and sick with a cold, so switched gears to make a cold buster soup. Mix the broth created when the roast was cooking with the cooking water from the sweet potato preparation for a nutritionally powerful base for adding sliced carrots, diced scrubbed potatoes with skins, finely chopped onion, minced garlic, sliced celery, then salt and pepper to taste. The broth is strong, but i added 2-3 oz of roast chopped into small pieces to this dish. All in all this yielded about 5 cups of deliciousness. Bring to slight boil, then simmer 20 minutes, but longer doesn’t hurt, just mind keeping on the lid so the moisture doesn’t get away. Feel free to add water for a thinner soup. One complaint i have about buying the organic celery stalks is they trim the leafy tops. Why is that!?! Surely they are putting them to good use. Nevertheless, i slice off the very tip small ends, the chop of the fat end just so the stalks will separate. Wash the lot, then bundle it back and slice off several inches of the small ends, then open up the bundle to reveal the leafy and lighter green pieces – slice them up – all goes into the soup. The remaining short stalks should serve well as snacks or stuffing with peanut butter for dessert. The little bit cut off can be easily composted or as in my case i feed to my pasture chooks. This is my go to when i’m short on time for anything – don’t even need meat. Saute a finely chopped small onion in the saved fat drippings from cooking the roast. After a couple minutes, cut or chop fresh spinach into the skillet, stir those around until softened, then add as much crumbled roast as you want, then add eggs. This is one of the recipes where you can add as much or as little as you need to make the meal. Plus, dress it up even more with sliced fresh mushrooms, sliced black olives, shredded cheese. Or exchange the spinach with any leftover greens you have in the frig. Since i used all the broth for the sick day soup, white gravy made with milk will be a great substitute. Onions are for healing, so finely chopped and sauteed in the beef fat before adding flour and milk creates more robust and healthful gravy. Chipped roast, smashed potatoes, white sauce with onions dressed on side with steamed broccoli. Still working on that roast prepared Sunday afternoon. Plate 5-since I had time whilst the potatoes cooked (meal 4), went ahead and finished off the little bit of roast left. Grind the meat, hard cooked eggs, chopped pickles if you like. Stir in mayo, mustard. Serve with crackers or veggies. Alternatively, make sandwiches. To squeeze out another power soup, use the cooking water from potatoes and steamed broccoli – chop onions, carrots, and the stems of the broccoli – add to the water and bring to a boil. Season with salt, pepper, and even parsley, sage, rosemary, and thyme to boost flavour if you like. Although i seldom use rosemary or thyme simply because i don’t like them! So, there’s a small example of roast flexibility, whatever it’s worth!